JUST REDUCED!!!! FIRST $3000 OWNS IT!! The Used Fifth Wheel - 2004 Newmar American Star 30BKCL you are looking for is already out camping! 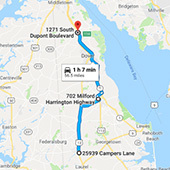 Here are some similar units from Delmarva RV Center that you might enjoy!